Police at the site of one of two shootings in Pomona on Wednesday Oct. 23, 2013. 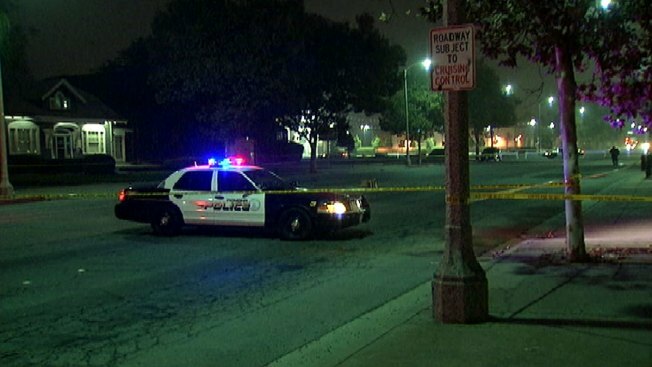 A second person died late Wednesday morning after shootings at two locations within a two-hour period overnight in Pomona. The first shooting was reported late Tuesday in the 1300 block of San Bernardino Avenue. Two male victims were shot outside a residence -- one died at the scene, another was hospitalized with multiple gunshot wounds, but died late Wednesday morning. One of the men died on the front lawn of the family home, according to family members who reported about a dozen rounds of gunfire. The victim is a father of two sons, according to family members. "He moved his hand, but then he didn't talk anymore," said a resident, who witnessed the shooting from her bedroom window. The second shooting was reported early Wednesday near Holt Avenue and Paloma Drive. One person was hospitalized in critical condition. Details regarding the victims' identities were not immediately available. Authorities are attempting to determine whether the shootings, which occurred just blocks apart, are connected. The homicides bring the total number of homicides to 24 this year in Pomona, which reported 17 homicides last year and 11 in 2011.